My Fitness Journey So Far..
I’ve been blessed enough throughout my life to always have a very healthy, outdoorsy family and active friends, and so have never had a real physical issue with excess body weight. Self-image, however, has been an entirely different story. I suffered in high school with self-love, as I felt that no matter what I did my body always had these parts to it that I just hated and could not get rid of. I attended the gym casually with my friends, however at the age for us it was 100% a social activity. This social work out schedule faded, and I don’t think I worked out at all from the end of Grade 11 to about one year after graduation. After I’d taken my year off, I began redeveloping my interest in physical fitness, and after moving out of my parents’ house when I was 20, I began attending university through which I also had a free gym membership; that was the beginning of my motivation to take work-outs more seriously in my weekly routines. I loved the feeling that consistent workouts was bringing, however I quickly began to grow very tired of the busy gym-style environments; always bumping shoulders with people, having to wait for equipment… it just didn’t feel like it was where I wanted to spend my time anymore. I have a body in mind that I want and know I can have, and so I did not give up. Through a Bidding Wars website, I found a brand new cable-based home gym system for $80.00, bought it, and haven’t been to the gym since. I have so far added a bench, a lateral thigh trainer, and a chin-up bar. I truly believe I have found my niche: not having to pay, drive anywhere or put any effort into my appearance, is how I prefer to exercise. Thanks Steve for the info on 'Strength training at Home' it has taken my training in a new positive direction. Don’t change yourself to fit an environment… CREATE an environment that fits YOU! Join in and write your own page! It's easy to do. How? 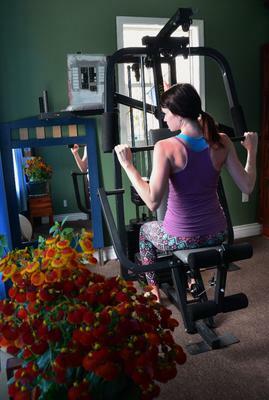 Simply click here to return to What type of strength training at home gym have you designed?.